THE BEST QUALITY ON THE MARKET - Clear Night offers you the highest quality glasses made from high grade professional metal. TAC POLARIZED LENSES - Our lenses are TAC polarized to keep your eyes safe and clear, and allow for maximum glare reduction so that you can see clearly and drive safely. TAC polarized lenses are also more resistant to scratches than other lenses. STYLISH AND COMFORTABLE - We designed our glasses with both safety and comfort in mind so that you can stay focused on the road and not on adjusting your glasses. MAXIMUM VISION AT NIGHT - Don't allow high beams to distract you from the road. Stay clear and stay safe with the best anti-glare lenses you can get. PERFECT FOR LONG ROAD TRIPS - Great for those who like to take road trips or those who drive at night. 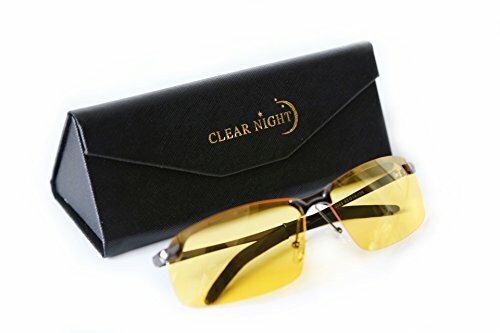 Clear Night glasses are essential for all night time drivers. Clear Night is dedicated to providing safe night time driving. Our state of the art TAC polarized lenses will offer you the most protection from blinding glare. Don't risk your safety and the safety of others, be prepared. Our mission is to provide comfortable and stylish options for safe driving. Be ready for your next road trip and stay comfortable without the irritating feeling of wearing uncomfortable glasses for too long. Have a Clear Night and a safe drive. 1 - Stylish Protective carrying case.